Check out Contrabass Conversations Episode 224 with yours truly! A huge thank you to Jason Heath for having me on again! Today’s podcast features an in-depth conversation with Peter Tambroni. This is a “round two” conversation that builds upon the topics that we covered in our previous talk on episode 204. Today we dig into fallacies surrounding public school teaching, instrument setup, life planning, instrument insurance, practicing ideas, teaching philosophies, and much more. This episode is a gold mine for anyone interested in taking their teaching game to the next level! 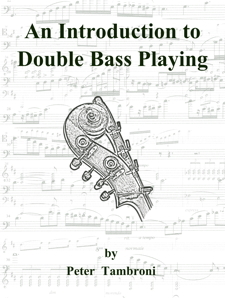 Pete is the author of An Introduction to Bass Playing, which is now in its seventh edition, and is an active bass performer, teacher, and author. You can learn more about Pete on his website petertambroni.com. look at the distribution of music teacher positions – are people full-time orchestra, part orchestra and part general music, etc? finding the goal note should not be a fishing expedition! Mathias Wexler article about shifting in American String Teacher journal: “Throwing The Dart and Other Reflections on Intonation” from the November 2004 issue of American String Teacher.